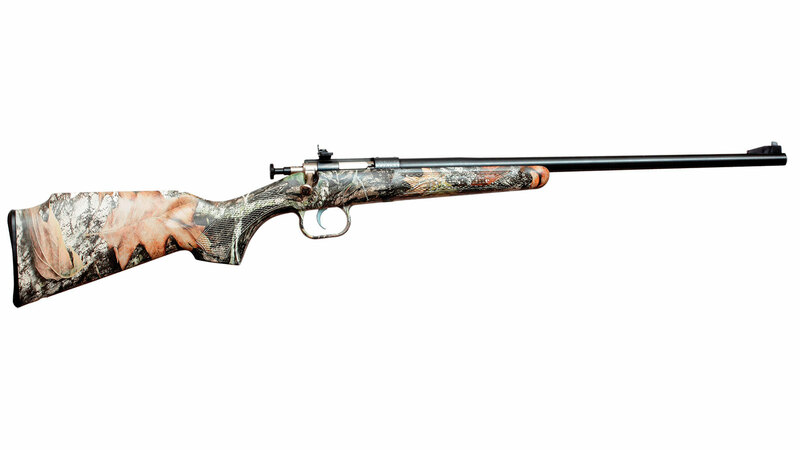 Crickett KSA2284 Single Shot Synthetic Bolt 22 Winchester Magnum Rimfire (WMR) 16.125 1 Synthetic Mossy Oak Break-Up Stk Blued in. Crickett rifles are the staple of the youth shooting experience. A manual cocking singleshot bolt action it features a rebounding firing pin safety to prevent accidental discharge 2.53 lb. trigger pull 11.5 length of pull and a 16.125" barrel. Crickett rifles have a fixed front sight adjustable rear peep sight and are drilled and tapped to accept Crickett scope mounts.This model has a synthetic Mossy Oak Break Up stock with a blued barrel."